My friend Lisa and I had a conversation this week about the new stuff we ordered recently, and she said she wanted to see some of it in action. So Lisa, this is for you! This is a take on Natasha's FTL 42. I added little black pearls to the ends and tip of the umbrella. The dp is from Cosmo Cricket (Early Bird) and the stamps are from PTI (Scattered Showers). Technically, Scattered Showers was from last month's PTI order, but it still counts as new because I haven't gotten it inky yet. And this month's PTI order should be here any day. My hubby always complains because I get packages and he never does, and I told he just has to start stamping and the packages magically start coming in the mail! He declined, shocker. I knew I was getting low on my beloved kraft cardstock and went ahead and ordered some the other day. Well, I actually counted my sheets today, and I have only TWO left! Good thing some more is on the way, or you would be hearing my shouts of horror from over here! Note to self: keep better track of most important cardstock. Anyway, hope your holiday weekend is wonderful. Thanks for stopping by! What a cute card Becky! I really like the black pearls and that ribbon is terrific. Oh Becky....love, love, love your card!!!! Happy Friday!!! yea! love, love love it! you totally cracked me up with your "start stamping and packages magically start to appear!". I too, got down to 2 sheets of kraft cs, that's what prompted my SU order. Thankfully it arrived before I used it all up. Becky this is absoltuely adorable!!! Ilove the added detail of the beads at the top and bottom! Too, too cute! And I love the patterned paper and the use of the Kraft! A great layout and desing! Very cute! Perfect with that sketch, love it! Thank you, Lisa, for making you use this set that I have yet to use!!! Love this, Becky!! So cute, Becky! 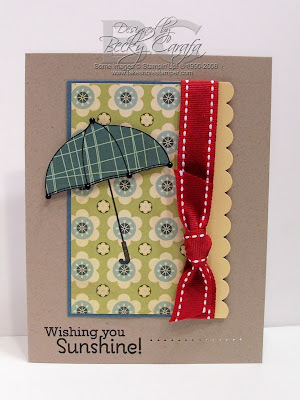 I adore that paper pieced umbrella! It looks good.The umbrella looks great. Who or what is PTI please?